When it comes to altering your diet to help control your diabetes, I know a lot of people who worry that they’ll have to sacrifice flavor for health. Thankfully, I know that’s not the case, which is why I like to share healthy, flavorful recipes with you on my site whenever I can. Checkout these Meatballs with a Sweet Lemon Glaze from Diabetic Living—so good, they’d make the top of anyone’s dinner request list. I hope you enjoy, and be sure to maintain regular visits with your Houston podiatrist for comprehensive foot exams! In a large bowl combine green onions, oats, egg product, 2 teaspoons of the lemon peel, the crushed red pepper, and salt. Add beef; mix well. Form into 1-inch meatballs. Lightly coat an unheated large nonstick skillet with cooking spray; place over medium-high heat until hot. Brown meatballs in skillet, turning occasionally. Meanwhile, in a small bowl combine spreadable fruit, the water, 1 tablespoon of the soy sauce, and 1 tablespoon of the lemon juice. Lightly coat an unheated 1 1/2- or 2-quart slow cooker with cooking spray. Add meatballs to cooker and pour the fruit spread mixture over all in cooker. Cover and cook on low-heat setting for 4 hours or on high-heat setting for 2 hours. Using a slotted spoon, transfer the meatballs to a plate. In a small bowl whisk together the remaining 1 tablespoon soy sauce, 1 tablespoon lemon juice, the cornstarch, and remaining 1 teaspoon lemon peel. Whisk into the cooking liquid in slow cooker. Gently fold in the meatballs. If using low-heat setting, turn to high-heat setting. Cover and cook about 10 minutes more or until thoroughly heated and sauce is slightly thickened. 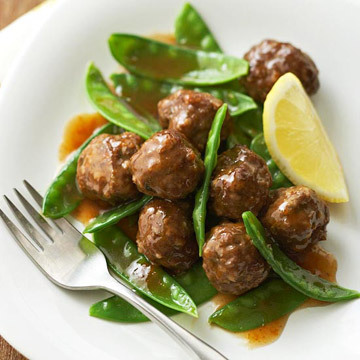 Serve meatballs over snow peas. If desired, sprinkle with black pepper and serve with lemon wedges. Serve and enjoy. 8 meatballs is equal to one serving.